ww2dbaseRaoul Gustav Wallenberg was born in 1912 in Sweden into a wealthy family. His father Raoul Oscar Wallenberg, was a naval officer; his father passed away from cancer before he was born. His mother was Maria Sofia Wising. In 1918, his mother married Fredrik von Dardel; with Dardel his mother was to have two more children, son Guy von Dardel and daughter Nina von Dardel (later Lagergren). In 1931, he studied architecture at the University of Michigan in the United States, where he also learned to speak German, among other languages. Upon returning to Sweden, he found out that his American degree did not qualify him to work as an architect in Sweden, thus he went to work for a Swedish construction materials firm in Cape Town, South Africa. Between 1935 and 1936, he worked for a branch office of the Holland Bank in Haifa, Palestine. In 1936, he was hired by the Central European Trading Company in Stockholm, Sweden. The company was owned by Kálmán Lauer, a Hungarian Jew. In 1938, as Hungary began to pass anti-Semitic laws, it became progressively harder for Lauer to travel to Hungary, and by 1941 Wallenberg had become the firm's representative to that country. He quickly picked up the Hungarian language. In 1942, he became a joint owner and a director of the company. In spring 1944, American diplomat Iver Olsen arrived in Stockholm, looking for someone who was willing to help the American War Refugee Board to work in Hungary to help Hungarian Jews. Having already wanted to take on a greater cause in his life, he accepted the task when Olsen approached him. He arrived in Budapest, Hungary in the summer of 1944 as a secretary assigned to the Swedish embassy on the pretense that he was a newly assigned secretary. In this role, he issued many protective passports to Hungarian Jews, which effectively made them Swedish objects, and Wallenberg could then prevent them from being deported by the Hungarians to concentration camps. To house these Jews, he rented 32 buildings in Budapest of various sizes (using funds provided by the War Refugee Board); he declared these buildings extraterritorial much like the general treatment of embassies on foreign soil. Soon, he took on actions that put him directly between Hungarian authorities and the Jews. On more than one occasion, for instance, he arrived at railroad stations where Hungarian police were loading Jews onto rail cars; he walked among the Jews, either making up stories of how he recognized some of the Jews as those working with Swedish firms, or whispering instructions to them to answer his later call of fake names, ignoring warning rifle shots that the Hungarians fired over his head. It was a generally accepted estimate that he had saved the lives of more than 10,000 Hungarian Jews. ww2dbaseWhen Soviet troops entered Budapest, the Soviet leadership viewed Wallenberg with suspicion as he was known to have knowledge of various Soviet atrocities committed in the recent years. On 16 Jan 1945, he was taken into Soviet custody, accused of being either a spy for Germany (as he had been near-openly working against Nazi German efforts to deport Jews yet never stopped by the Germans) or for the United States (with records of suspicious fund transfers from the United States). Five days later, he was transferred to cell 123 at the Lubyanka prison in Moscow, Russia. Some time after that, he simply disappeared into the Soviet prison system. Members of Wallenberg's family engaged in what was to become a decades-long effort to locate him, writing letters to the Soviet leadership as high as Joseph Stalin. On 8 Mar 1945, despite the earlier statement noting that he was taken into Soviet custody, Soviet sources announced that he had been killed in Budapest in Jan 1945 either by German occupation troops in Hungary or by Hungarian Arrow Cross Party members. In 1957, a released Soviet document noted that a prisoner by the name of Wallenberg died from possibly heart attack or heart failure on 17 Jul 1947; it was generally agreed that this Wallenberg was indeed Raoul Wallenberg. The fact that an order was given to cremate the body without autopsy suggested that he might had been killed by his captors. In 1981, through the efforts of United States Congressman Tom Lantos, who was one of the many saved by Wallenberg, Wallenberg was made a honorary citizen of the United States; he was the second person to receive this honor. In 1986, he was named by the Yad Vashem memorial in Israel as a member of the Righteous Among the Nations. In 1989, the Soviet Union returned his personal belongings to his family, claiming that these items were found in an old store room. His family, who did not trust the Soviet government in the least bit, did not stop searching for him, believing that there was a chance that he was still alive, hidden somewhere in the Soviet prison system. In 1991, his half-brother Guy von Dardel, now a retired CERN physicist, began a new initiative to search for him; this effort also failed to conclusively trace the whereabouts of Wallenberg after his arrest in 1945. In 2000, Russian prosecutor Vladimir Ustinov stated that Wallenberg was a victim of political repression, thus exonerating him of all crimes. In Oct 2016, he was declared dead from a legal perspective by the Swedish Tax Agency; the official date of death was 31 Jul 1952, five years after he had definitely disappeared. 4 Aug 1912 Raoul Wallenberg was born in Kappsta, Lidingö, Sweden. 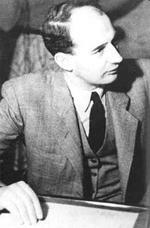 7 Jul 1944 Raoul Wallenberg departed for Berlin, Germany. 8 Jul 1944 Raoul Wallenberg landed at Tempelhof, Berlin, Germany and traveled to his sister's residence in the southwestern suburb of the city. He would experience his first air raid during that night. 9 Jul 1944 Raoul Wallenberg boarded the 1721 train from Berlin, Germany for Budapest, Hungary, arriving later that night. 10 Jul 1944 Raoul Wallenberg reported to the Swedish embassy in Budapest, Hungary as a secretary; in this role he would issue protective passports and commit in other acts that would save the lives of thousands of Jews. 19 Jul 1944 Raoul Wallenberg might have met with Adolf Eichmann at the Hotel Majestic in Budapest, Hungary. 13 Jan 1945 Raoul Wallenberg approached troops of 7th Guards Army of Soviet 2nd Ukrainian Front in Budapest, Hungary and requested to meet with Marshal Rodion Malinovsky in regards to the 7,000 Jews in Pest who were under his care. 16 Jan 1945 Soviet foreign office in Budapest, Hungary told Sweden that Raoul Wallenberg was in Soviet custody. 17 Jan 1945 Raoul Wallenberg was transferred out of Budapest, Hungary for Moscow, Russia by the order of Joseph Stalin's deputy Nikolai Bulganin. 21 Jan 1945 Raoul Wallenberg was transferred to the Lubyanka prison in Moscow, Russia. 25 Jan 1945 Raoul Wallenberg was interrogated at the OKR of Soviet 18th Rifle Corps in Russia. 6 Feb 1945 Raoul Wallenberg was transferred back to the Lubyanka prison in Moscow, Russia. 8 Mar 1945 The Soviet Union announced that Swedish diplomat Raoul Wallenberg was likely killed in early 1945 by German occupation troops in Hungary or by Hungarian Arrow Cross Party members. 17 Jul 1947 Raoul Wallenberg passed away in Soviet captivity to unknown cause. 6 Feb 1957 The Soviet government released a documented dated 17 Jul 1947 noting that Raoul Wallenberg had passed away unexpectedly, possibly of heart attack. Later Russian research efforts concluded that he was likely executed. 5 Oct 1981 Raoul Wallenberg became the second honorary citizen of the United States. 29 Mar 2016 The Swedish Tax Agency announced that a petition filed by Raoul Wallenberg's trustee to have Wallenberg declared dead in absentia had been submitted. 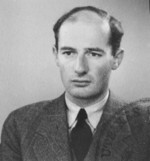 If Wallenberg would not report to the agency before 14 Oct 2016, he would be declared dead legally. 26 Oct 2016 The Swedish Tax Agency declared Raoul Wallenberg dead legally.